There is a secret world where ancient evil weaves a modern mystery… they call it Little China. It’s where Big Trouble was waiting for Jack Burton and his friends as they uncover an ancient diabolical plot. The evil minions of the immortal ghost-sorcerer Lo Pan are waiting to chop down the players with axes and guns in dark alleys and all throughout the battle-torn streets of Chinatown. Now, Jack, Wang, Gracie, and the rest of the gang must muster up all of their courage, survive against hordes of baddies, and then face off in a showdown with the darkest demon of them all Lo Pan! 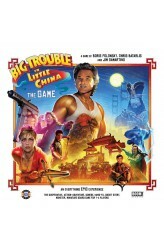 Big Trouble in Little China the Game sends you and up to three other players on a wild adventure to experience the unknown and mystical underworld of Chinatown. Each brave character uses their own.. 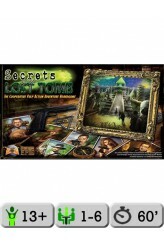 Secrets of the Lost Tomb is a cooperative game of thrilling action-adventure and discovery. Players assume the roles of stalwart expedition members working together to investigate ancient mysteries, while surviving dangers and shielding humanity from the supernatural powers of The Tomb—an ancient vault filled with primeval powers perpetually struggling to be set free upon the world. Powers that mankind should never behold… The Details: Each of the game’s Scenario-Scripts has its own unique theme, flavor, and powerful boss monster bringing you into the rich and detailed world of The Tomb. Prepare to prevent the second coming of the Immortal Rhaz Azul, reject the Pharaoh with the Blue Eyes that’s not of this world… or battle against the Elder Forces of Hera’Thulhu seali..